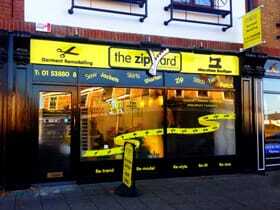 The Zip Yard Blanchardstown offers the best clothing & garment alterations service in Dublin 15. We pride ourselves in dealing with our customers on a personal level. Our services included Restyling,Tailoring, Bridal, Curtains, Dry Cleaning, Alterations and Repairs. Wardrobe Weeding is a must , restyling what is already in you wardrobe and bringing it up-to-date to the trends of the coming season. 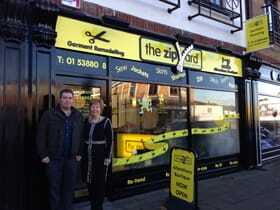 Join us on Facebook and Twitter to keep informed on all our Zip Yard news. We regularly post pictures of the transformations of the garments that have being worked on. Here in The Zip Yard Blanchardstown, we have highly skilled and experienced seamstresses who take pride in their work whether it a small repair, garment redesign or bespoke creation! We offer a host of specialised services such as curtain and blind making, suit tailoring, leather and fur repairs, and manufacturing from design patterns. Customers can walk into the shop without an appointment, and where necessary garments will be immediately measured or pinned in one of of our large fitting rooms. We employ specialised fully qualified seamstress to ensure all wedding wear is fitted to perfection. Evening time appointments can be made on request. We offer a ‘1 hour EXPRESS service’ for hems, zips and minor repairs where you can wait in the relaxed atmosphere of the shop. Our text service ensures you are notified once your garment has passed quality control and is ready for collection. Earlier this year at the franchise awards The Zip Yard was awarded the Irish Franchise Of The Year award for 2015. Alterations Carried out for Hotels & B&B’s including – Curtains, Pillows, Throws, Duvets, Cushions, Soft Fabrics, bedding all altered and repaired. Specialists in Hotel & B&B Curtain relining. Please submit your CV to apply for a position listed below.